Silver mounted hunting flasks, hip flasks and sandwich cases were carried by hunting and shooting parties well into the 20th century. Silver hip flasks are still popular today with a good example fetching £150 upwards at auction. 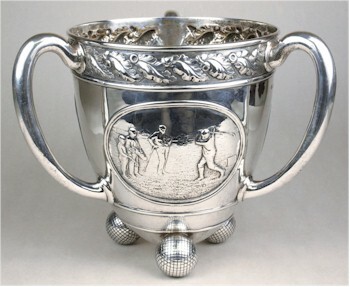 A late Victorian, silver three-handled golfing trophy cup, which sold for £1,800 in the silver and metalware section of a Sporting Auction. Smoking accessories were also decorated with sporting themes and good enamelled vest cases are very popular with collectors. The silver and enamel cigarette case and the silver and enamel vesta case seen below are two good examples of the pieces produced at the turn of the century. 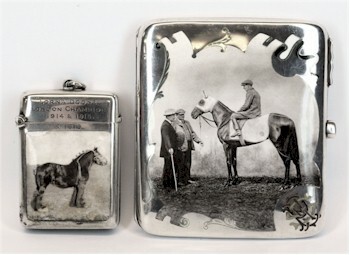 An equestrian-themed silver and enamel cigarette case and vesta. 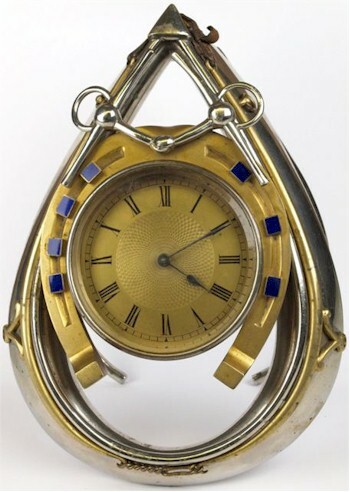 Sporting trophies and presentation pieces can regularly be found at auction, from simple silver cups to mare elaborate pieces such as the silver plated and gilt horse harness clock seen below. This gilt and silver plate mounted horse harness mantel clock was one of the more elaborate presentation pieces offered for sale in a Sporting auction. 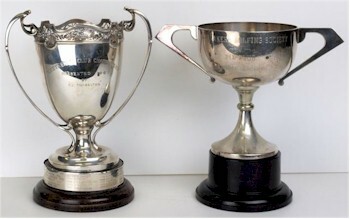 Silver trophies and cups were presented for a wide variety of events from shooting, tennis, football field sports through to motor racing at all levels. Small trophies for local events are obtainable from £30-£50, while silver trophies from well know or international events range from £500 upwards. Sporting trophies such as these are regularly found in our Sporting auctions.